Abstract. Helsinki Arena 2000 is a large consortium project headed by Helsinki Telephone Corporation. It has been running since early 1996. The main goal of the project is to provide the citizens of Helsinki an enabling platform through an affordable high bandwidth multimedia network in the year 2000. The project consists of three simultaneous development processes. The first process develops and tests services and user interfaces to them integrating the results of many national and international multimedia research projects. The second process creates an easy user interface to the services through a real 3D model of the city of Helsinki. This gives us many possibilities in augmenting the real city and provides a totally new viewpoint to the large web information systems. Finally, the multimedia network which already works in some areas of the city is being extended to other areas. Unlike other networks that provide high bandwidth from the service provider into the homes, this multimedia network is the first commercial network which is capable of transmitting guaranteed good quality video between any two homes. This gives the citizens many new possibilities for communicating with each other as well as with the local communities and businesses. Furthermore, homes connected to multimedia network are able to transmit video up to thousands of other homes. Helsinki Arena 2000 is a large consortium project headed by Helsinki Telephone Corporation. The administrators of the City of Helsinki are in major role in the consortium. Other participants represent the local businesses and universities, but also global information and telecommunication companies like IBM, ICL and Nokia. Many companies view Finland as an information society laboratory because of the high mobile phone and internet penetration. This and very technology friendly user base makes Finland a promising place to experiment with new models of network behaviour. Helsinki Arena 2000 project aims to provide the citizens of Helsinki advanced web platform and services through an affordable high bandwidth multimedia network. These services as well as the multimedia network are planned to be widely available by the end of year 2000. This year is important because it is the year when Helsinki celebrates its 450th anniversary and is one of the cultural capitals in Europe. So at year 2000, plenty of cultural activities will be available through the network. In addition to providing ready-made services to the citizens, the aim is that the citizens themselves can exploit the possibilities of the network in their personal communities adding more value to their life. The support of high quality two-way video connections and multicasting gives a lot of possibilities for this. The project has been running since late 1995. It consists of three simultaneous development processes. The first process develops and tests services and their user interfaces mainly in various pilot projects. The second process is developing an easy user interface to the services through a real 3D model of the city of Helsinki. Finally, the multimedia network which covers some areas of the city has been extended to cover all of Helsinki in late 1999. The starting-point of Helsinki Arena 2000 are the needs of the citizens in their daily life. This includes considering their roles and activities within a family, in their free-time, as employees or students in an organisation and as inhabitants of the city. This goal is somewhat similar to the goals in electronic villages that start from citizens grass-root needs aiming to give everybody a possibility to participate. Blacksburg Electronic Village [1, 2] is a good example of that. The goals of Helsinki Arena 2000 project differ somewhat from the interactive TV based networks, such as Time Warner Full Service Network or GTE mainStreet. These TV based networks are typically more closed and they provide their customers rather completed and polished sets of services . In Helsinki Arena 2000 project our aim is that the citizens of Helsinki have an important role in developing new uses of the network. In this and in the sense of the 3D user interface perhaps the closest ideological counterpart of the project can be found in Digital City Kyoto  even though that project does not concentrate on the physical network issues. In order to get most of the citizens into the network, a lot of education is needed. First, it is important to awake the interest of the citizens to the Helsinki Arena 2000. This is already happening as the 3D model of the actual city makes many people very enthusiastic and curious. Also the video-phone is interesting when people see its possibilities in their daily life. The second step is to eliminate their fears to technology. The 3D model works also here as it creates a conception that using computers is as easy as walking down the streets of Helsinki. As we anticipate that the web browsers will develop into more usable direction , we also believe that this will be true in near future. Naturally, technical help solving problems with the computers needs to be easily available. Finally, we need to provide the citizens interesting and easy-to-use services that help them in their daily life. Even though the concept basically relies on citizens and businesses creating their own services for each other there are many platform type services that need to be created centrally. In addition we see that a fundamental change in behaviour patterns can be speeded up by creating services as examples and as basic attention grabbers in order to get a large enough user base to start growing its own services. In Finland many people have a positive attitude towards new technology that adds value to their daily life. There are over 60 cellular phones per 100 Finns. Furthermore, according to Statistics Finland in spring 1999 there were about 110 Internet host-connections per 1000 Finns. By the end of 1999 the Finnish government starts issuing electronic identities to the citizens. These enable people to sign official documents and contracts over the net. Finland is also world leader in electronic banking with over 20% of the population using home banking systems. These are leading figures in the world. This is a good starting-point for getting users interested in Helsinki Arena 2000. Many viewpoints can be taken to the Helsinki Arena 2000 project. Here we will mainly concentrate on discussing the development of the services, the 3D-model and the network, their basic concepts and how these can be easily provided to the citizens. The usage of the 3D model of the city as a user interface to the services is in key role here. This city model gives us many possibilities in augmenting the real city and provides a totally new viewpoint to the large web information systems. Our goal in developing the virtual city is that it will be profitable both to the end-users and to the businesses. By profitable we mean not only that the businesses can maintain their services without subsidiaries but also that the taxpayers or community members find the public services or community provided services worthwhile to use their tax or membership money on. The multimedia network is nothing but the technology to enable communication and make services available. The video-phone is one of the very basic services. In addition, we need to have a wide selection of other services that the users want and a user interface through which these services are easily accessible. To get the companies interested in investing and developing services we need users, and to get above a critical mass of users we need to offer them interesting services. In Helsinki Arena 2000 we have solved this typical booting problem by starting several pilot and research projects which develop and test services with the users and act as catalysts. Services developed with the city of Helsinki are in a central role in this development. These are developed in EU supported projects, such as Infocities and Equality. In addition, we have also other EU projects as well as several projects with Finnish National Multimedia Program (KAMU) and Eurescom, which is a research consortium of the European public network operators. In addition, we are hoping to encourage various hobbyist and special interest groups to use the network for their own interests. To get a sample view of the service development the Infocities services developed in Helsinki are discussed in more detail in chapter 2.1. Figure 1: Web Interface to Infocities Services. Infocities is a European Commission funded project in TEN Telecom program. Digital services for the citizens are developed in seven European cities Helsinki being one of them. In Helsinki the services are developed in co-operation with Helsinki Telephone Corporation and the city of Helsinki. These services include public and civic services, Helsinki City Museum services and cultural services. In addition, the Virtual Language School developed in the National Multimedia Program is being tested by users. Many public and civic services are traditionally provided to the citizens by the different bureau’s of a city. The development of the integrated public and civic services started from thinking about these services from the citizens' point-of-view. The services were organised according to the different roles of the citizens, such as a tourist, a house builder, an organiser to a happening. Furthermore, we also wanted to find out any new needs in citizens every-day life. Our hope was that Helsinki could provide better services with less burden to the employees of the city. Finally, we considered how the multimedia network and the possibilities it offered could enhance these services. For instance, ip-phone and video based techniques are being experimented on. The services of Helsinki City Museum are developed to the ordinary citizens interested in the history of the city and also to the school children. Our aim is to make history so interesting by using multimedia and visualisation that many new citizens would be interested. For instance, the 3D modelling offers the museum people tools to show already non-existing buildings, such as a model of the centre of Helsinki at 1700 before the current empire style centre was built. By making the historical information available to the web will also help its use. It may hopefully even attract new people to visit the real museums. Figure 2: The Lasipalatsi building in the past. The Lasipalatsi project connects the citizens both in the real as well as in the virtual world and offers citizens advanced web based services. In the real city, Lasipalatsi is a building located in the middle of Helsinki. It has a digital library and freely available computers connected to Internet. It also offers citizens a digital meeting point which connects the real meeting point in Lasipalatsi building to the meeting points in some other cities. In addition there is a virtual version of Lasipalatsi. Virtual Lasipalatsi has been an experinment with several services. An user survey has already been conducted on the users of the 3D-meeting place in Virtual Lasipalatsi. Less than half of the users were able to function without any technical troubles with their viewers. Visual 3D layout was considered very good and the 3D-meeting point was considered very good service by 73% of the surveyed users. 79% of those that had visited several times intended to come again. 30% had used user to user communication, 29% had used 3D- product presentations and 25% had followed live radio broadcasts or live disc jockey performances. Only 2% had used electronic shopping in the Telco store and 4% had user other Telco services provided in Virtual Lasipalatsi. When we studied frequent visitors the picture was slightly different. Communication with other visitors amounted to 75% and live radio broadcasts to 54% and getting aquinted to other people to 54%. People generally wished for more cultural content. Overall the results were considered encouraging in this early phase. The multimedia network offers citizens different access and bandwidth levels. At the moment, we test most service-concepts for web with ISDN based lines. There are currently 50 thousand ISDN lines, from a total of 700 thousand telephone lines, provided to Helsinki Telephone customers and they get a discounted telephone rate from normal calling price when they connect to the multimedia network. XDSL connections have been available in some areas from 1997 and in 1999 they will be available throughout all Helsinki including suburbs. In 2000 the whole operating area of Helsinki Telephone will be covered. Even so the user base of xDSL connections starts to grow slowly and is not expected to rise over ISDN volumes until 2003. Through the multimedia network access and core services the network is available for all ISP:s who wish to provide their services through a common access point. Efficient usage of network resources allow for a lower price for connections than regular telephone network local call prices which are already among the cheapest non substituted prices in the world according to various studies. There are several areas of development which have required extensive study and where equipment and software suppliers have only recently been able to provide satisfactory standards based solutions. These include open multicasting, quality of service concepts, multipoint internet based video conferencing platforms and QoS-usage based billing infrastructures. Also efficient customer connection and maintenance systems have been developed only lately for xDSL accesses. These are all crucial issues for the community oriented business model that has been selected. Many different spatial 2D and 3D metaphors for hypertext information have been built and studied  to improve the user interface. Also the city metaphor has been used to visualize general hypertext information . The aim in using the spatial metaphors is to visualize larger information spaces with landmarks instead of just showing a single information node at a time. This helps the searching, comparing, analyzing and combining the information. The spatial environments can be extremely useful if natural mappings to the information are found from the point-of-view of the user tasks . So the understanding of the user’s task should be the moderating variable when the spatial coding is evaluated. Information of the services that closely relate to the city seems to be a perfect case for applying the city metaphor. First of all, this virtual city exists also in the real world. So it is at least partly known to many of its inhabitants, which makes the city itself meaningful. This helps in navigation and in creating a cognitive map that structures the services of the city. The city itself is also static, which helps the users to orient themselves and navigate within it. Furthermore, the virtual city will familiarize its users with the places and services of the real city. This is extremely useful for people who have moved in recently and even for those long time residents who want to learn more about the suburbs of their city. Finally, the 3D model interests people and hopefully motivates them to learn to use computers. The city metaphor nicely visualizes data that can be given an intuitive location within the city. In some cases, it might even work nicely with other kinds of data, such as the use of a non-existing city model for ordinary hypertext data . It could be even possible to use the city as a memory aid resembling the memory techniques where things are associated with objects along a familiar walking route. A sample view to the city with different types of links are shown in Figure 4. The 3D city concept enables location based search, which is naturally used in parallel with text based search robots and agents. However, we do not want to be constrained by the 3D model when other presentations seem to be more suitable. Therefore, we also offer ordinary graphical 2D web-pages and panorama views. All these views can be mixed with each other so that a user can select to mainly work on her 2D pages and follow links to the 3D city when needed. Alternatively, she can use the 3D city as an interface to the services in other formats. Figure 4: A view to the city with a video -, a phone -, and a web-page link. The different user interfaces are probably going to attract different users and also different communities. In addition, they will attract the same users at different times. The 3D model may be very useful for visualizing some data. In addition, it is more entertaining than the ordinary web-pages. For instance, it might be just fun to walk the streets of the virtual Helsinki when you are not in a hurry. You might look what kind of restaurants exist near your apartment, maybe even look inside from a video window or see what kind of sports or exercise services are located within a walking distance from your home. Also you might wander around hoping to meet someone with whom to discuss about this virtual city. From the technical point-of-view the virtual city itself is a large web information system which will be connected to an information database of the actual services offered to the users. The information system can be divided into five layers as shown in Figure 5. The bottom layer consists of databases, such as the structured 3D city model, web-link information and advertisements that can be shown in the virtual city. These should be easily updated by the businesses and communities through web. Various geographic information system databases are important also in the business sense. As the model will be commercially financed and will cover all of Helsinki there needs to be easy ways to support various GIS-applications and advertisement-type usage in order to get as many potential interest groups as possible to take part in paying for usage of the model or inclusion in it. The next layer is a system software layer that contains search robots, indexing and geocoding engines. These engines make searches and filter the databases. They are accessed through the positioning layer, which shows the results as 2D maps, part of the 3D city model or as different kinds of pictures (panoramic, still and video-images). Different applications are built on top of these bottom layers. They include multi-user applications, city-camera applications and games. The top layer of this model is a user interface layer. It consists of a general user interface and specific application interfaces which form a user interface to the virtual city. Figure 6: Phases of 3D Modeling. The structuring of the 3D-world is very flexible as can be seen in Figure 6. The source material is modeled into hierarchical objects which are stored into the database. Different models can be created from the database according to the goals of the modelers. For instance, if the file size is important, as in Internet, some details can be filtered away from the model making it considerably smaller. Various static GIS data and links can be automatically incorporated in the model and also dynamic positioning data can be incorporated. Currently, VRML translator is used to form the visible 3D world but enhancements are being made in order to distribute workloads and throughputs of the system. The next generation viewers and database servers will only transmit and use those objects and detail levels that are necessary for each user. A garbage collection system is also in development to support users who move through various areas in the city model without closing the model in between. The modeling and the tools for the model have been developed by Arcus Software. The Arcus modeling process consists of creating a base model and a model with facades and object handles with various attributes attached to them. Base model starts with aerial photos. They are taken from an airplane with flying altitude of 900 - 1200 meters. Photos are then used for stereo mapping. A 3D-stereographic line map is made from stereo pair photos and a 3d sulface model is made from this line map. Parallel with this work diagonal aerial photos are taken from a helicopter. This starts the second phase of modelling the facades. Flying altitude is 200-250 meters. Photos of building basements are taken from street level. Building facades are modeled using Arcus software tools and photos. Facades are modeled using doors, windows and other real world objects instead of mapping digital bitmaps on walls. These have been pre-designed to various building style libraries to create efficient modelling environment. Model includes very little dumb geometry. Most things are stored as intelligent objects. Street is a street, window is a window, tree is a tree etc. As the final model consists of relatively optimized objects with bitmaps only as optional decorations the model size is very small. This is extremely important as the model will be distributed on line and design goal has been that it should be usable over ISDN-lines. Different parts of town are modeled with different amount of details. City center, main streets and sub urban centers are modeled with high amount of details. Side streets and sub urban areas are modeled with less details. Landmark buildings are most important because they are used for recognizing places. The following estimates give a fairly good approximation of model sizes and required effort converted to commercial modelling prices of professional modellers. Helsinki center model will be finished in the year 2000. The model will cover 30 km2 and the required storage or file size of the complete model without application dependant data is 300-400 MB. Cost estimate is $ 1 million. Helsinki metropolitan model will be finished in 2002 covering 450 km2 and a population of 1 million people. Size of this model is approximately 700-900 MB and estimated modelling cost will be $ 5 million. A completely different set of values is reached in Kainuu which is also being modelled and finalized in 2002. Kainuu is a province of 24 000 km2 and population of 100 000 people. The whole province of 24 000 km2 will be modelled and it will include besides provincial model also models of rural villages and surroundings 600 km2 and urban center models 10 km2. Estimated modelling cost is $ 0.5-0.75 million. This efficiency is largely based on converting automatically digital maps from the rural areas to Arcus modelling objects. The 3D city model integrated with the 2D metaphors inspires many exciting new uses. Location based search adds interesting new possibilities for interaction. All kinds of data can be looked through the city model user interface. The data can be related to video commerce, multi-point video telephony, entertainment, virtual meetings, community meeting points, or real-time video from public places of the city. It will be exciting to see how far it is possible to go with this kind of a user interface. This will be examined as the Helsinki Arena 2000 project evolves. Sample applications are discussed in the following chapters. Some of the discussed functions are already implemented, at least as pilot versions, and others are just being brainstormed. Figure 7: Telephone numbers attached to an address in the virtual city model. One already implemented experiment is the use of the city model as a phone catalog with names and phone numbers connected to the corresponding building (Figure 7). Furthermore, as the multimedia network is connected to the normal telephone network, these numbers can be called by just clicking on them. This gives new possibilities to situations when a user remembers a building by its look but names or numbers are missing. For instance, you might want to contact a nice shoe store you visited lately, but can only remember its location. Also your little daughter might want to call her friends in the neighborhood, but she only knows how to get to their houses. In the city model this can be done by clicking the phone icon attached to the door of the building. The experiment showed that it is practical to create the telephone links automatically from telco databases and the telephone line co-ordinates and addresses. There is an ongoing research activity between Hewlett-Packard Bristol Labs, Helsinki Telephone and Arcus where integration of mobile data is studied. Intention is to create a distributed messaging environment where all moving vehicles such as buses and, taxis could be shown as corresponding avatars with their links in the model. This system needs to be distributed in two ways. It needs to be open so that anyone can start sending their own message streams in the virtual city. In addition, any user should be able to freely select which part of the information flow he wishes to receive through his communication link. Furthermore to support extendibility there should be no central server. Currently the intention is to study whether we could move from HP´s preliminary platform to their forthcoming commercial but freely distributed E-Speak-technology. Helsinki Telephone has already announced a service for voluntary publication of the positioning data of mobile phones. This information will be linked to the respective mobile services in the virtual model. In addition, to providing users information from moving objects in he form of avatars in the virtual city there are plans to integrate the yellow pages information to the virtual model. In these plans the yellow pages and other telephone catalogue search facilities become essential part of the city model so that the user of the model can get pinpointed to all barbers or all restaurants and possibly even see immediately if they can make reservations. There is also a study going on about getting tourist guidance type information on objects of interest near by. Helsinki Arena 2000 project aims to support rich communication among the ordinary citizens. This means that also different network communities should be supported. Some of these communities will be formed totally virtually while others have very strong connections to the physical world. Different design dimensions for these communities are discussed in . In the virtual Helsinki you can meet your friends as avatars just as you meet them in the real Helsinki. In the virtual world you just do not have to leave home when it is raining or snowing heavily. You can use the same popular meeting points, such as in front of Stockman’s warehouse or at the Lasipalatsi Clock tower. You may even experience the same crowds together and possibly get to know some other people in these crowds. In addition, to the real and virtual Helsinki, there exists an underground 3D meeting point which gives the designers and the users more freedom to explore the imaginary worlds, participate and create something of your own. We felt that there is a need for imaginary virtual meeting places besides the reality based ones also. 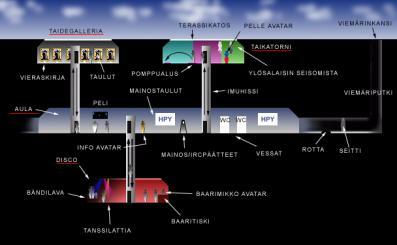 Figure 8: A map of the Helsinki Arena 2000 underground meeting point. Helsinki Telephone Corporation has a number and address service number, which is usually called 118 service. In addition to providing people with right numbers or addresses when name is given, it also provides more advanced services. For instance, it may find a person a restaurant according to her wishes or a repair shop when something has happened to a car. This service is also available through the web. It has been studied how the 3D model of Helsinki would help the 118 service people when they are guiding the customer to a certain place. They could look the landmarks, such as big or easily identified buildings and give their directions by using these landmarks. There has also been a study on how the web based phone numbering service and search engine service for yellow pages could be combined with 3D-model. A further version of these could be able to send fasted information of the notable landmarks and the destination even to the travelers mobile phones. Already it is possible for a user to show another user across the network how first to reach the correct destination in Virtual Helsinki. Currently this can be achieved with H.323 conferencing applications but more efficient methods are studied. Helsinki Arena 2000 is an ongoing project whose near term goal is in year 2000. At the moment, isolated parts of the multimedia network are already available and larger scale availability is very near. Also the central parts of the virtual city model as well as some services are available for experimenting purposes and large scale production of the citywide model has started in early 1999 when the tools were ripe enough. As we gain more experience with the virtual city we will see more and more possibilities for its use. Already many citizens are giving us enthusiastic feedback about it after seeing some possibilities of the virtual city being demonstrated to them. However, there is still a lot of exciting work to be done to develop more ideas, experiment the services and the user interface, and test our virtual city with the users. Many people contribute to Helsinki Arena 2000 in Helsinki Telephone Corporation, in City of Helsinki in Arcus Software and in other participating institutions. We want to give our special thanks to Aimo Maanavilja, Kari Lehtinen, Pertti Hölttä, Tauno Hovatta, Harri Palviainen, Timo Simula, Immo Teperi and Kyosti Laamanen who provided us many valuable comments. We are also grateful to Jukka Lehikoinen who was very helpful in finding us articles and books. Carroll, J. M. and Rosson, M. B. (1996) Developing the Blacksburg Electronic Village. Communications of the ACM, Dec 1996, Vol 39, Number 12, pages 69-74. Cohill, A. M., Kavanaugh, A. L. (ed.) (1997) Community Networks: Lessons from Blacksburg, Virginia. Artech House. Schwartz, E. (1995) People are Supposed to Pay for this Stuff? Wired, July 1995, pages 149-191. Cooperative Information Agents III, Lecture Notes in Artificial Intelligence, Vol. 1652, Springer-Verlag, 1999, pages 23-35. Mohageg, M. et al (1996) A User Interface for Accessing 3D Content on the World Wide Web. CHI’96, pages 466-472. Card, S. K. (1996) Visualizing Retrieved Information: A Survey. Computer Graphics & Applications, Vol 16, No. 2, March 1996. Dieberger, A. (1993) The Information City: A Step towards Merging of Hypertext and Virtual Reality. ACM Conference on Hypertext, Seattle, November 1993. Shum, S. (1990) Real and Virtual Spaces: Mapping from Spatial Cognition to Hypertext. Hypermedia, 2(2), pages 133-158.